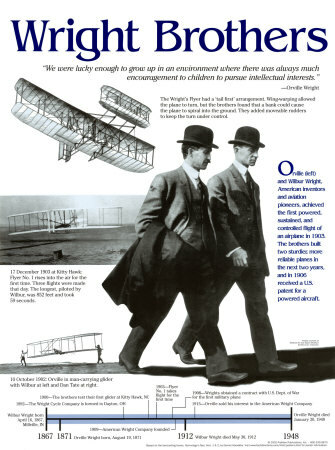 Wright Brothers invented the flying machine that gave birth to the aviation industry. Air travel would not be possible without their invention. It is an incredible 20th century achievement and a success story. Wouldn’t it be great if we could learn something from their experience in solving difficult problems that we face at work, business and in our lives ? I would like to tell you one interesting idea from their life that can guide you on your track to success. When Wright Brothers were busy building Wright Flyer in 1901-03, they were not alone. The idea of creating a flying machine was really hot at the time. Wright Brothers were not the only ones trying to invent the airplane, there were other teams trying to achieve the same thing, the first sustainable human flight. They were not at all “original thinkers” (they were more like tinkerers). So why the Wright Brothers became successful in inventing the flying machine and not others ? They were just bicycle mechanics with much more limited budget than other teams in the race. The key problem in inventing the flying-machine at the time was the correct wing design. If you could design a wing such that it create high air pressure at the bottom and low air pressure at the top it would help lift the plane. All teams were busy trying alterations to their wing design and test them in the field. The whole cycle of idea to testing and back to the drawing board ( modifications to the wing design, building the new wings and testing ) would take weeks and months and lot of time and money was spent for each iteration. Wright Brothers thought differently about this key bottleneck of the development cycle. Instead of spending months in the traditional design process, they used the wind-tunnel for the first time in the world to design the wings. 2. Small Scale : No need to create life size wings, you could just create few centimeter size wings and test it in a wind-tunnel. 3. Low Cost : No need to hire test pilots and workers to go fly your prototype. The wind-tunnel allowed them to reduce their time/money/effort cost in design-develop-test cycles multiple orders of magnitudes. That means, they could try orders of magnitude more iterations than other teams. This way they were able to try 100s of alterations per day for the wing before they get the desired results. This way they were able to do 10 years of work in a week compare to other teams with the fraction of the cost. Shorter trial and error cycle helped them get ahead of other teams and stumble upon a great solution. This technique is called Fail-Fast. It is a very important factor in deciding the outcome of your work when you are trying to work on something new and unknown. Make sure you fail more , fail fast and fail cheaply.